I played golf today at my country club. They had temporary greens (duh), but I was surprised how little snow there was laying around. Usually that course holds snow longer than just about anywhere else in Erie county. At any rate, I played to the temporary pins. Course played just about as long as usual because balls went about four inches into the ground, so even though the flags were 25 yards short of normal, the lack of roll on drives just about compensated for this. I gave myself everything inside of five feet. I was going to give myself everything inside of six feet, but everything I hit was either eight feet or under five, so it ended up being five feet. I don't make every five footer, of course (though I'm pretty solid inside of three feet), but this rule also removes the possibility of me making a few putts over five feet per round, so I think it just about evens out. Turns out I had three bogeys and two birdies for a 73! I struck the ball really well. Above is one of my birdies, on the sixth hole, with an 8-iron on the par 5 from about 135 (160 to center of the green). I used the r7 460 today. It doesn't have as much trouble hitting the ball high like I thought. I will have to find that thread and post again. I think using non-range balls and a proper tee height - the one in the dome was a tad low - led to the low bullets. I had a good ball flight with the 2 heel/14 toe weight setting. This is "neutral" so I was able to draw and cut the ball at will. I used the 2006 TM RAC TP irons. I'd put them right between the 735 and the 680s - they're not QUITE as forgiving as the 735s, but they're also not quite as harsh as the 680s. I say "harsh" because I'm laking a better word... I like harsh in irons, in that I like to know where I missed. The TPs have a more.... uniform feel than I typically like, but without being quite as forgiving as the 735s (where the uniform feel is okay because the shots are uniform too). Either way, they're right there in the realm of clubs I like - good feedback, etc. I could hit high and low shots, I could work the ball, and the distance seemed good. I hit a few shots fat because I was standing too close to the ball. But otherwise, and despite not really swinging a golf club since November, I played pretty well. Crisp contact, worked the ball, etc. Last year I couldn't stop hitting fat shots and I blamed the mats at the dome for their poor feedback. I think it's true. I'm glad my game is good enough at this point that I won't embarrass myself when I go to the TaylorMade event near Augusta on April 2/3. That's all I can think to say at this point. The course looked to be in pretty good shape, but we've had a really mild winter. Very little snow mold, very little damage anywhere. It should open up pretty quickly and be in good shape from the get-go, and that's good. P.S. That's a PW in the picture, for measurement's sake. 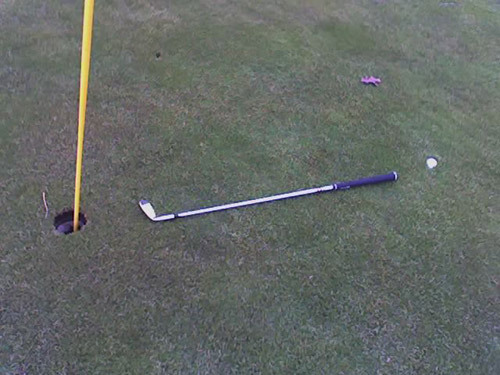 The shot was hit with an 8I from 135 or so.